I was in Paris for eight days and this app worked great on the technical side however it led me to three sub par restaurants and therefore 3 really disappointed experiences. 1. The first was La Penderie. The atmosphere was awesome but the wine was terrible and my chicken was super dry and tasteless. The charcuterie and creme brulee were good but the mixed drinks were awful and service was slow. 2. The second was Cosi a sandwich place which was ok but nothing exceptional. I felt Patricia Well's review was overly exaggerated and my friends I took there were not impressed. However the service was nice. 3. The third was Cafe Napolean. The view of the church on the plaza was quaint and relaxing. The review recommended the nicoise salad which i ordered and it was totally gross canned dark meat tuna. Not fresh. However I do highly recommend the nicoise salad at Da Rosa in adornment 6. The service at Cafe Bonaparte was extremely slow. It took us 45 mins to get our bottle of wine. I would have much rather spent my 100 euro for another night at Le Gorille Blanc, best variety of French cuisine and best value in Paris. Rabbit and duck confit are to die for. Love this new app and can't wait to put it to good use during trip to Paris in a few weeks! The long awaited update was well worth the wait! This is the only guide you will need to explore the wonders of the Paris food scene. Beautifully written and extremely well researched, Patricia Wells takes you on the perfect culinary tour of Paris. Great incites into both the classical bistrot cuisine of Paris and the ever changing ethnic cuisine..... I am ready to book a flight to Paris, a must have app for the lover of all things culinary. This delightful app has a map with GPS, which is reason enough to get it. Then it maps out the nearest places and gives Patricia Wells’ take on it. 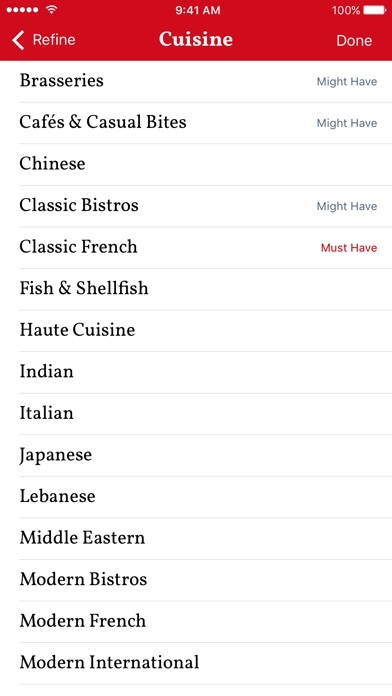 I probably went to 15 places from this app, maybe one was disappointing and at least half were terrific and things I would not have found on my own. Wonderful! For those of us who have been yearning for a new edition of the Food Lover's Guide to Paris, here it is at last, better and easier to use than ever. It is full of great information - like having a friend who knows all the best places. Patricia Wells is an inspiring guide and teacher who has once again invited us all along to explore the culinary landscape of Paris. 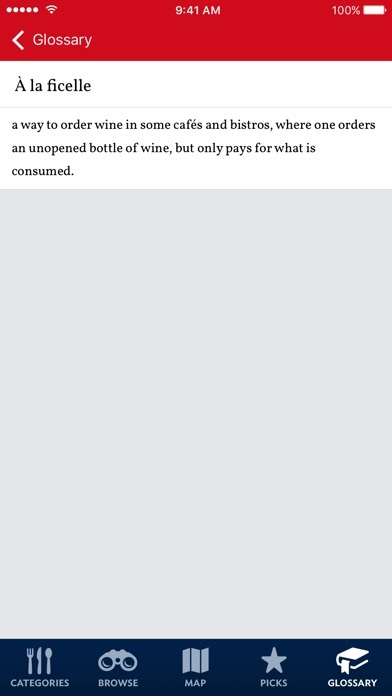 The Food Lover's app is an indispensable companion. Delighted to have a portable and updated version of the book and built-in maps are very helpful. There are however a number of rough spots, such as blocks of unformatted text. Worst is the built-in web browser which seems to only work in portrait mode and zoom function does not work so text is generally too small to read and buttons are too small to activate reliably. This app literally made my trip to Paris ten times better. The map feature made it so easy to find a great restaurant wherever I was in the city. So worth the fee! I love Paris. I love food. This is the App of my dreams. And what a bargain. I'd pay this much just for the delicious French culinary glossary. Merci Madame Wells! Great app! The map is worth it alone. Super helpful for a recent stay in Paris. Found most info to be accurate (prices, hours, signature dishes, etc) and every place we went to via this app was excellent. The most useful aspect was actually the map. The GPS and map works offline so we used this to find our way around Paris. 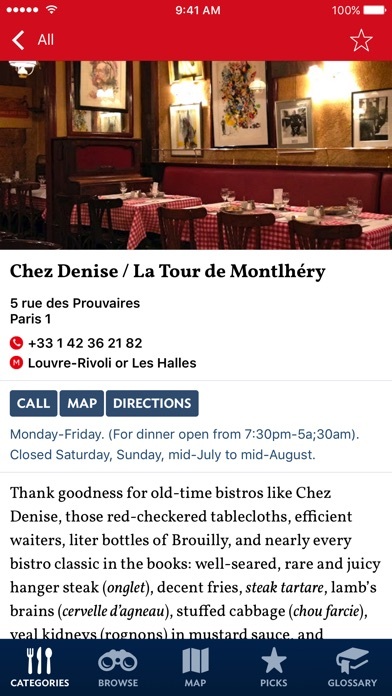 Definitely download this app if you're visiting Paris -- and especially if you like to eat! Patricia has done all the leg-work for you, her reviews are informative and trust-worthy, and the map is incredibly useful even if you're just out for a stroll. It has saved me several times when I've gotten lost in a maze of winding streets, looking for a good place to shelter from the rain. Don't come to Paris without it! Un tres bon app! Loved this app; used it on our recent trip to Paris. 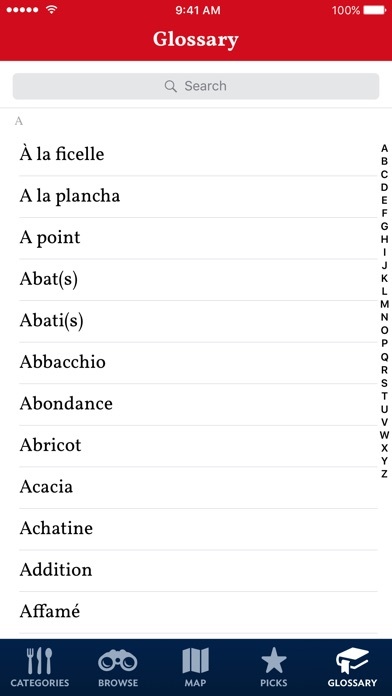 Don't overlook the extensive Glossary as many of these descriptions do not appear in French dictionaries. I am a big fan of Ms. Wells's reviews and write ups so I was eager to install this app when I learned of it. The substance is great so far, but unformatted text at the end of each entry is very distracting. For $5.00, I would have thought that that there would be greater attention to detail. 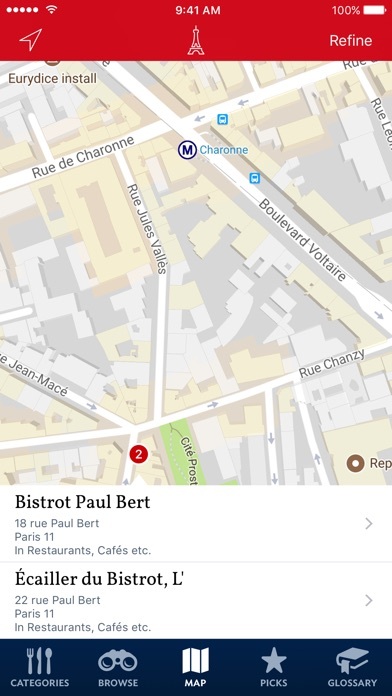 This app is a must-have for foodies of any stripe visiting Paris. I am a frequent visitor to Paris and have tried many of the restaurant recommendations: I have never once been disappointed. This is now my go to resource for dining out in Paris. There's a rich variety of picks to satisfy a wide range of styles and palettes. You will also find many very reasonably priced options (which is a real plus, if you are looking for great value: there's no shortage of good eateries in this city, but many of the better known ones will burn big holes in your wallet). More informative than ever. Great style and fun. How can you visit Paris without it? Easy to use, smart, on target. Can't wait to pound the pavements and try every last item. A Must Have. The map requires an internet connection to download it on the fly. Not good for international travelers at the mercy of costly data plans. The current version shows as a simulated iPhone in the middle of my iPad screen. Disappointing. Looks like a TON of GREAT information somewhat poorly presented. As a big,long-time fan of Wells, I was eager enough for this App to upgrade my iPod. But after having more "misses" than "hits" with her recommendations, I'm using only trip advisor reviews for the rest of this trip. The glossary is useful. A recent purchase but the tile page opens and then the app freezes. I tap all the options - map, search, address etc. and nothing happens. I would rate this much higher if this bug could be corrected. If you're heading to Paris and love food, The Food Lover's Guide to Paris app is a must have. Patricia Wells is the best of the best!